Panoramic and scenic pictures from the Romandy region (Western Switzerland). Panoramic picture of Lavaux and Lake Geneva. Panoramic picture of Lake Geneva at Geneva. Picture of the steamboat Geneva at Geneva. 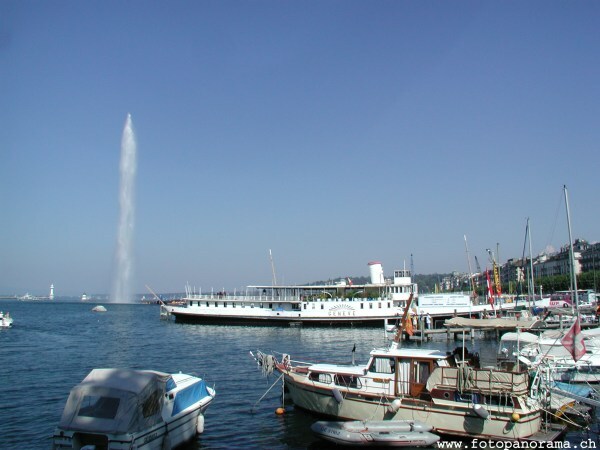 Picture of the Jet d'eau (Water Fountain) in Geneva. Picture of the Temple de la Madeleine in Geneva. Picture of the Arteplage-le nuage (the cloud) of the national exhibition 2002 at Yverdon. Picture of the beach at Yvonand. Panoramic picture of Corseaux with the Nestle building. Western Switzerland, also known as "Romandie" or "Romandy" is located in the western part of Switzerland near the border to France. A mountain chain, called the "Jura" stretches along the border to France from Geneva to Basel. Its highest elevation is 1717 meters above sea level. Between Lake Geneva in the south and Lake Neuchatel, the landscape is rather flat and extensivly used for farming and industry. In the south east, parts of the Swiss Alpes are located within Western Switzerland. The major cities: Geneva, Lausanne, Neuchatel and Yverdon are defenitely worth a visit. You should not miss the lakeshore of Lake Geneva between Lausanne and Montreux. You will feel like at the French Rivièra, with the difference of having the alps in front of you. If you are in the Jura and like hiking, go aling the Doubs River. You think there are no sandy beaches in Switzerland? Well then visit the campsite "VD8" near Yvonand! Western Switzerland becomes part of Frankish Realm. The Confederation leaves the German Empire. Occupation of Western Switzerland by Napoleon. -> The Helvetic Republic, a centralistic french satelite state is founded, the occupied territories (like Voud) become independent. Voud joins Switzerland as independent Canton. The Cantons of Neuchatel and Geneva joing Switzerland. Creation of the Confederation we know today with the Capital Bern. The Canton Jura declares independency of the Canton Bern and joins the Confederation.